Today I want to share an elegant and glamorous look for a Dinner Party. I went for a dress with sparkly details and dainty jewellery, of course finished off with a pop of red lipstick. Don't know about you, but red lipstick is a must for the holiday season in my book. What's your favourite holiday lip combo? Such a cute dress! LOVE your lips and hair!!! So pretty! Happy New Years! sweet dress !!! you look fab. I think this lipstick make you extra beautiful. Love this. Happy New Year. What a cute NYE outfit! I love the metallic stripes details! I love your outfit and your hair looks so lovley here too! Your dress is so wonderful elegant! Such a pretty dress! The shine makes it feel fancy, and I like the classic cut. Gorgeous look! Hope you had an amazing holiday! Love the dress and the colour of the lipstick! I totally agree with you, red lipstick is a must! You looks so gorgeous! Love your lips! Beautiful dress! Happy New Year dear! That dress is gorgeous! I love the style, just enough sparkle and pizzazz. Looks great. Hope you have a great New Years Eve! perfect nye dress! you look so chic and lovely! You look absolutely stunning. 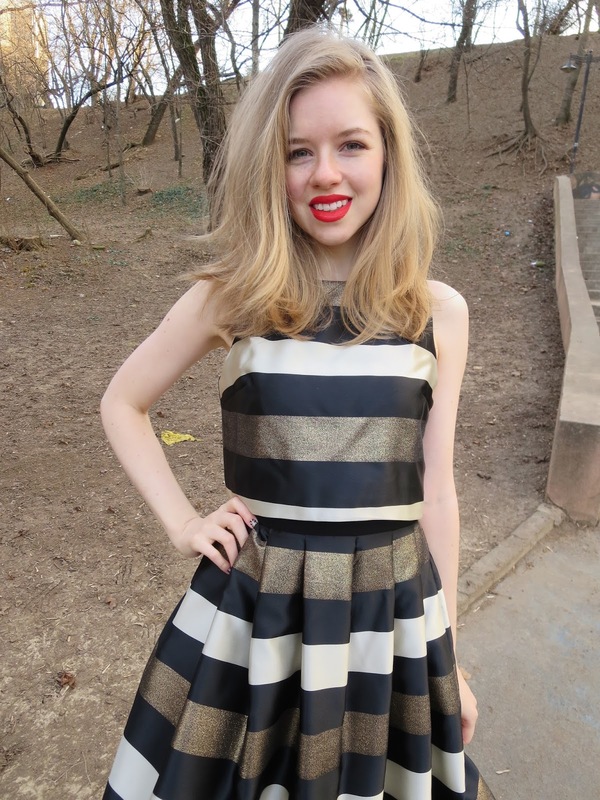 The dress is perfect for NYE!